A few weeks ago I received an email from Steve Saepan of Tiux Premium Performance Compression Socks. 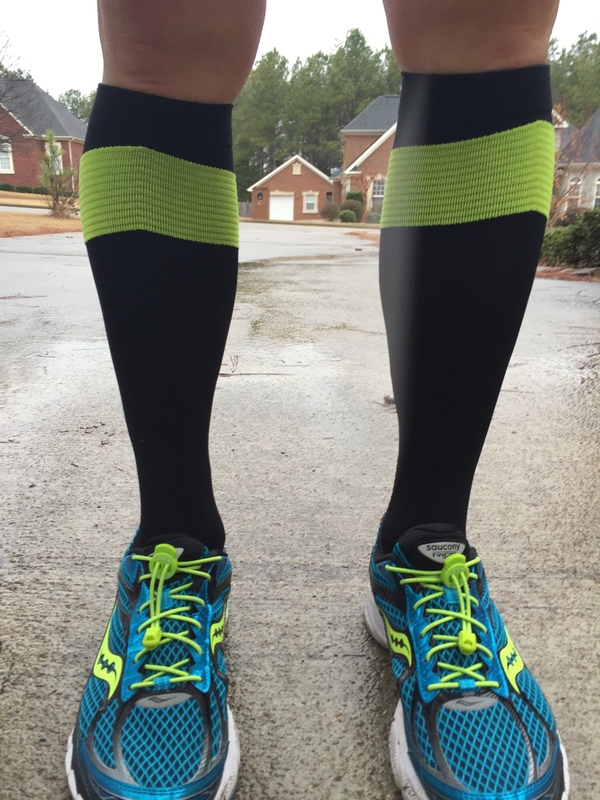 I’m a sucker for a good compression sock or sleeve so I agreed to review a pair. Not HIS socks, mind you. That would be kind of gross. A pair of his company’s socks. Clean as far as I could tell. He sent me a gratis pair and off I went. The plan was to wear these socks a few times on my daily runs, which I did. And later I planned to wear them in the last 20 miles of the Lake Martin 50 Mile race, which did not happen. I DNF’d the race at mile 33 and never got a chance to change into the socks. Fortunately, I’ve run in them several times and have a good 30 miles in the socks. I’ve also worn them around the house a few times by way of recovery. So I can give a pretty fair review. I’ve always used compression sleeves because I am peculiar about my socks. I was slightly reticent to surrender my sock predilection in favor of the all-in-one compression socks, but I did enjoy the compression aspect around my feet. More and more sock makers seem to offer a compression feature, if only around the arch. Tiux socks felt nice; not too thick, but not paper thin such that you might worry about blisters on a long run. 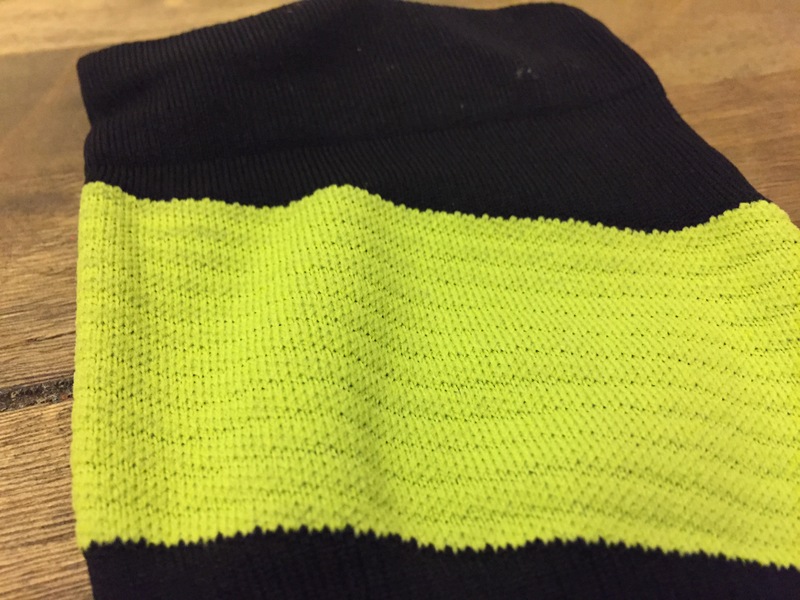 An added benefit of the Tiux sock is that they’ve built in some achilles support along the back of the sock which I like a lot and think very useful for late in long races or training runs. Compression sizing has always been tricky for me. I want a snug fit but not one that constricts blood flow and makes my feet numb and tingly. I’ve had big brand compression that didn’t feel like compression at all, even though I fit squarely within one of their sizing categories. Studies conflict when it comes to the benefits of compression. Some dismiss it as mere placebo while others credit the blood flow benefits to recover and rejuvenate tired muscles. At any rate, the benefits of compression are a highly individualized thing. If it works for you, then go with it. If not, fine. But how many of us know how snug compression should be for optimal return on our compression investment? I don’t. I rarely see info pieces about that. So we are left with feel, which again is a highly individualized thing. You know when it feels right. You know when it doesn’t. Tiux felt right. They didn’t feel like glorified tube socks, like the big brand I mentioned earlier. They also didn’t feel as if I was being slowly squeezed to death. There’s also the matter of length. 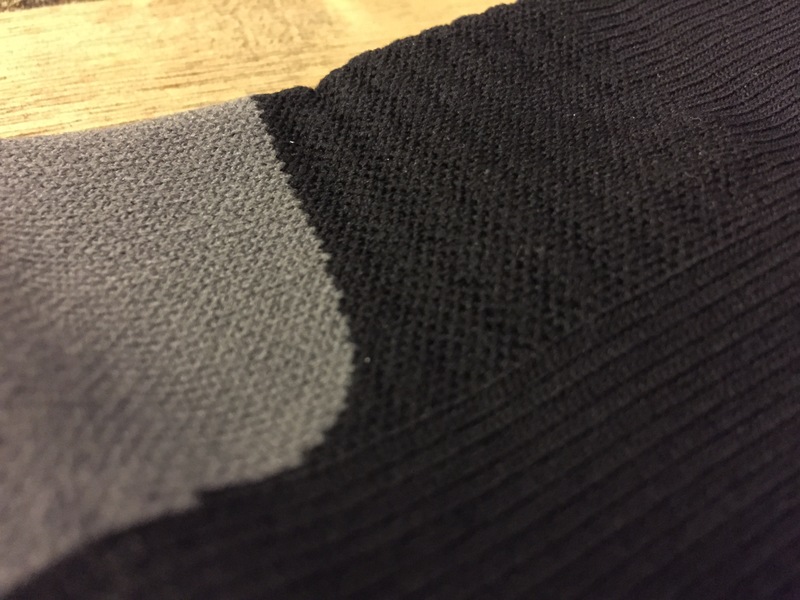 This is the tricky part of compression socks versus sleeves. If your lower legs are short then you run the risk of looking like a Catholic schoolgirl with socks up over your knees as you run down the road. If your legs are longer, then you look like you have a pair of expensive crew length socks. I’m 5’8” with a 32 inch trouser inseam. Tiux socks came to just below the lower part of my kneecap. Perfect fit. Because of their Goldilocks size and snugness the Tiux socks felt good. I felt the support of the compression but little else. I want gear that supports me but doesn’t necessarily remind me that I’m wearing it. Like a good pair of shoes, all my other running gear needs to disappear while I run. Tux did that wonderfully. My feet felt nice during my testing runs in the wild and unpredictable weather that comes with spring in the the U.S. south. These socks performed well under all conditions. They didn’t move or need adjustment after I put them on. Good stuff. I was excited about using them at Lake Martin. They seemed to be a perfect late long run change of gear for me to look forward to after many hours on my feet. I regret that I didn’t get that chance. I’ve worn Salomon, Zensah, Sugoi, and CEP compression in one form or another over the past 6 years. Tiux is a new company and not well known yet, but their product is just as good as any of the bigger brands you see in the compression world. Let’s say that Tiux is just as good as, if not better than, these bigger, well known brands. What then do we use then to set them apart? How do we choose one over the other? Cost to the consumer. Tiux socks are so much more affordable than the bigger compression brands but without a decrease in quality. Their business model is unique and refreshing and saves a great deal of money without sacrificing performance. I took this from the Tiux website because it best illustrates what I am trying to tell you about their business model. I did a little research of major brands and the cost to consumer. Salomon Exo Calf sleeves are $55; Zensah Socks are $49.99; Compress Sport socks are $60 and their sleeves are $70; CEP sleeves cost $40 while their socks cost $60; and CW-X socks cost $49.99. Most if not all of these brands also charge you for shipping. Tiux has created a no-retail, no endorsement business model that supplies them to you for as cheaply as I’ve seen compression offered (with free shipping! ), except for end of year sales. That’s not bad for some solid compression. I’m impressed with Tiux. The cost is superior and the compression is as good as any I’ve worn. They’re slowly expanding their color options, too, which will help sales and growth. Give them a try. You can find Tiux at their website, on Instagram, Twitter, and facebook. 1) Your model is direct online sales with no traditional retail path. As you’ve said, this allows you to keep the price point low (including no shipping charges), but I am curious how you came to this decision? Do you think it will set you apart from other compression brands? I wear compression socks and was paying $60 or $70 for a pair. I didn’t think these brands were offering a fair price and saw this is an opportunity to start my own brand. Our goal is to set ourselves apart by offering the most value, and we do so by creating high quality compression socks at a fair price. 2) Tiux donates 1% of its revenue to MAG (Mines Advisory Group), which helps communities around the world protect themselves and remove unexploded ordnance and the remnants of armed conflict. How did you select this particular organization to receive your donations? We wanted to partner up with an NGO that was involved in helping local communities around the world. MAG is a great organization and the work that they do has such a positive impact on these communities. It made sense for us to work with them. 3) Other than price point and the sales model, what sets Tiux apart from other compression brands in a crowded compression market? We set ourselves apart by providing the most value and convenience for our customers. We use premium fabric and work with the same manufacturers as other leading compression brands. However, our sales model allows us to sell our socks at a fair price with free shipping. 4) Tell me a little about how you designed these socks? How does one set about designing a compression article? What’s the process? 5) Tiux is a unique brand name and one that is just different enough to remember. What does it mean? Tiux, pronounced tee-oo, is a Mien word that means to run or jump.